It’s that time of the year again when the frosty blues and grays enveloping start to disappear and in their place awakens a plethora of colours, fresh and vibrant as if after a long hibernation. As if by magic, people’s spirits start to soar and life starts looking more – excuse the pun – ‘sunny’. This reminds me of the time when I was growing up – when as soon as the flowers started appearing, so did kites all over the sky, with people getting ready for the much awaited Basant festival. I loved everything about Basant when I was a kid. My khala used to have a huge Basant party on her roof top, family and friends would dress up in bright yellows. The ladies would be busy in the kitchen conjuring up some of the most delicious food for lunch. Everyone would have the yummy food on the rooftop, and then stay there – simply enjoying life. People would engage in friendly competition with the neighbours. The skies were full of kites, laughter, music and shouts of ‘Boo-kata‘. Basant was the event that brought the whole community together, something that is very rare in today’s time. 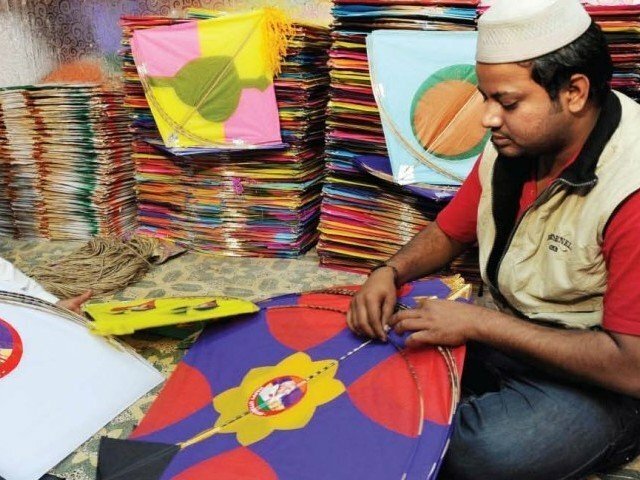 Basant was special because it was a festival for the rich, the middle class and the poor. Some people however, decided to take the friendly competition a little too far. They started making chemical dors (strings), which turned out to be lethal and claimed innocent lives. The kites started getting better, the string got thicker and more lives were lost from the fatal dor. 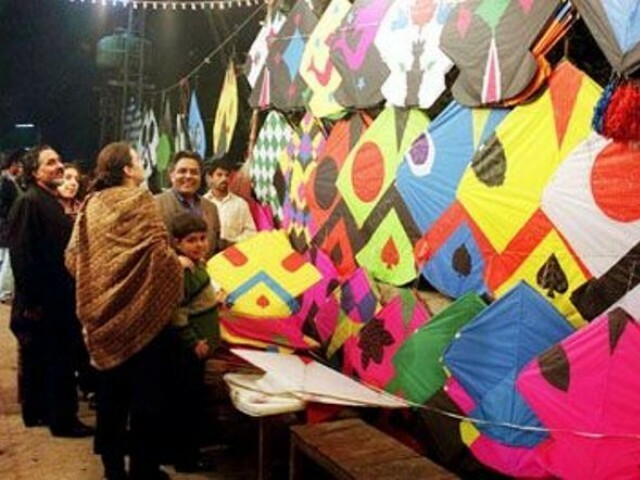 This led to the ban of Basant in the year 2005. I am totally against anything that would claim so many innocent lives, particularly victimizing the poor motorcyclists who were caught unaware by the kite strings. However, I wonder if lives could be saved without sacrificing a Pakistani tradition as old as our country itself. I wish the courts had focused more on what turned an otherwise safe event into a dangerous life threatening one. Instead of taking the easy way out, maybe if we all had taken responsibility of what was happening, Basant would still be here. I believe a better solution would have been the regulation of kite sizes and string types, so that dangerous strings that could claim lives were not used. Harsh fines and punishments should be linked with breaking these regulations, which can literally fall into the grounds of potential murder. Some people would raise their eyebrows that how can this possibly be implemented. However, I feel that if the legislature has so far quite successfully managed to keep a curfew of 10 pm at weddings, this is very possible too. If the courts do their part to bring back the festival, then the citizens must do theirs too. Our media is playing a powerful role, and it can help spread awareness of the dangers of Basant, so that Pakistanis start to take a responsible approach towards their lives and that of their fellow citizens. Public awareness should be raised about how children can fall over rooftops, how chasing kites is not half as important as saving your life and how people should explain safety to their children before the festival. Everyone who has seen the true spirit of Basant misses it to this day. I believe that instead of being overwhelmed by withdrawal symptoms, there is another safer and more rational way which can save lives and at the same time allow us to enjoy a much cherished festival. The verdict lies with the courts. saif bhai alot of innocent lives were taken from chemical dors which were used to fly kites i’m not supporting any religious fanatics but dont you think people who used chemical dors are responsible for the ban. Punjab did not surrender to religious people but to the fact that it started killing too many people. Basant had never killed that much people before due to the thread used in kite flying. It became a inevitable to ban it. I suspect, no body in Pakistan is more fond of kite flying than Sharif Bros. But they had to ban it due to killings of innocent lives. Sensible article with a positive approach to the subject. Stop blaming everything on the Mullahs. This is what happens when you dig too deep into the media which unfortunately only cares for its drama, instead of sticking to the truth. I can honestly say the ban was a relief. See we are a nation that only cares about our part of the deal; our fun, our entertainment, our this and our that. We barely think there is some muslim brother or sister trying to pray or get some sleep when the 6 feet tall speakers are blaring on our roof tops. The kind of things that happened in our neighborhood on basant – Allahu Akbar! Boys dancing shirtless on their roofs, drinking and doing out-right ridiculous stuff was not a part of the deal. But this is what happens when we so desperately try to copy the foreign culture. Frankly I don’t get it. We fight for years and years to get independence from a hindu-dominated society, only to produce a nation of mental slaves who can’t get enough of hindu festivals, bollywood and their stripped-of-any-modesty songs that would put the Americans to shame. I am glad Basant is banned. It should be banned again, this time forever, if it wasn’t banned for that term. Dear all I’m laughing out so loud on such comments in which ppl relate Kite-Flying with Hinduism. What is Kite and Kite flying string made of? Was it flown by Kali Mata for the first time or Ganaish ji used to fly that??? Great article. Its quite interesting how some fanatics and liberal extremists are labeling the ban as a surrender of the Punjab government to the religious parties. Basant may be very colorful and full of energy, it causes more harm than good. Last Basant cost at least 15 documented human lives, and an unaccountable economic damage due to abrupt power failures. The best thing is to ban it for good, or assign some areas where kite flying can be done independently. Right you are ! I hate Basant also, meri marzi !